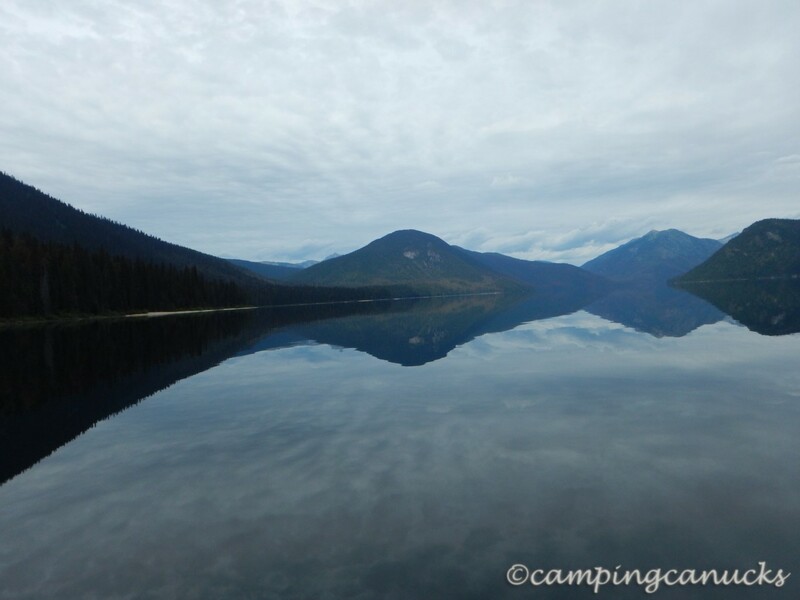 We decided to start our vacation in September 2014 with five days of canoeing around Murtle Lake in Wells Gray Provincial Park. 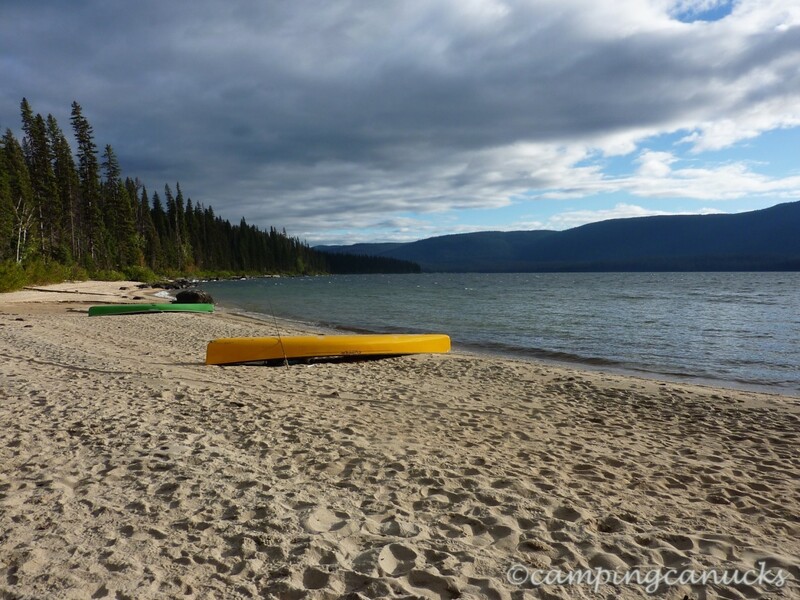 Murtle Lake has the distinction of being the largest canoe and kayak only lake in North America and for this reason, it is a major destination for people all over the world to visit and enjoy its pristine waters. We decided on a September trip as we expected the bugs to be mostly gone and less people on the lake at that time of year. 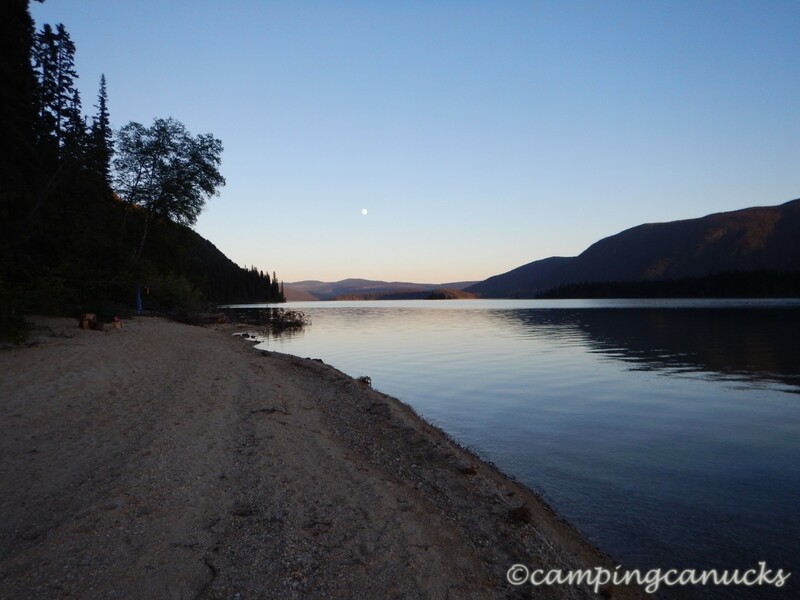 We spent the night prior to hitting the water in Blue River, the nearest town, before getting up and making our way to the trailhead. 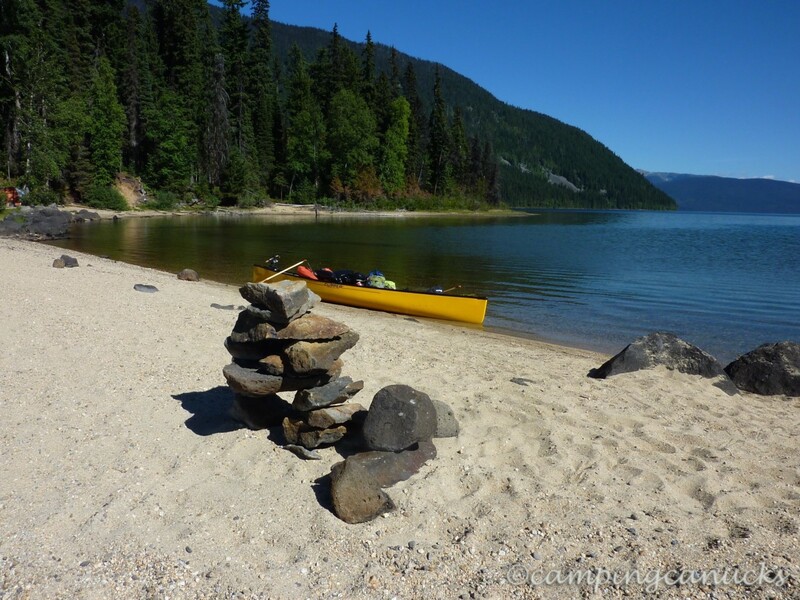 One of the things about Murtle Lake is that you must portage your canoe or kayak for two and half kilometers to the launch at the Murtle Lagoon on the eastern side of the lake, so we wanted to get an early start. A canoe cart is a must. Even with the cart, though, we soon learned that we had way too much stuff. While we love having along all the extras that a canoe can carry, portaging the canoe with everything we brought along was a lot of work. A little bit of anger and a whole lot of swearing later, we were in the water and ready to head out onto the lake. We didn’t have any particular plan for the lake on the clear, sunny day we departed. Due to the size, we figured we would just paddle each day as far as we felt like and camp at whatever campsite we landed at. 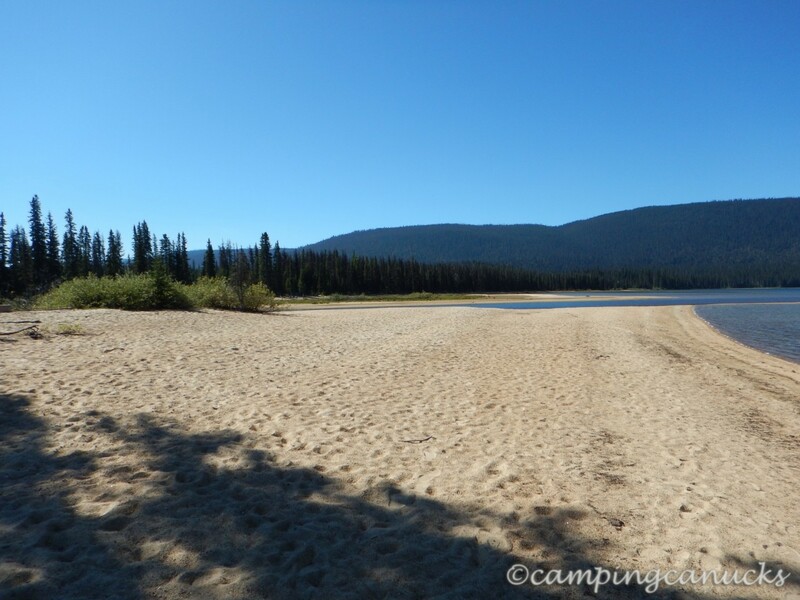 Upon exiting the lagoon, we came across the first campsite of the lake and one of the largest sand beaches we have ever seen on a freshwater lake. We pulled onto the beach, grabbed a nearby geocache, and had a quick snack before heading out. 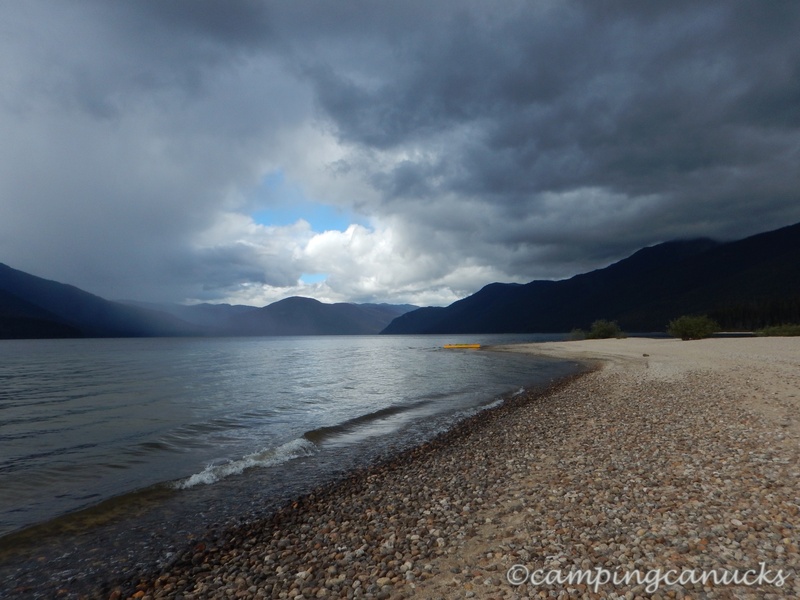 We decided that we would head west first, spend a day or two out there, and then move up to the northern part of the lake later into the trip. The next site we passed was Sandy Point. Being a clear day with an outstanding view of the Wavy Crest Range, we almost camped here because it was a very nice site and being early in the day still, there was no one camping. 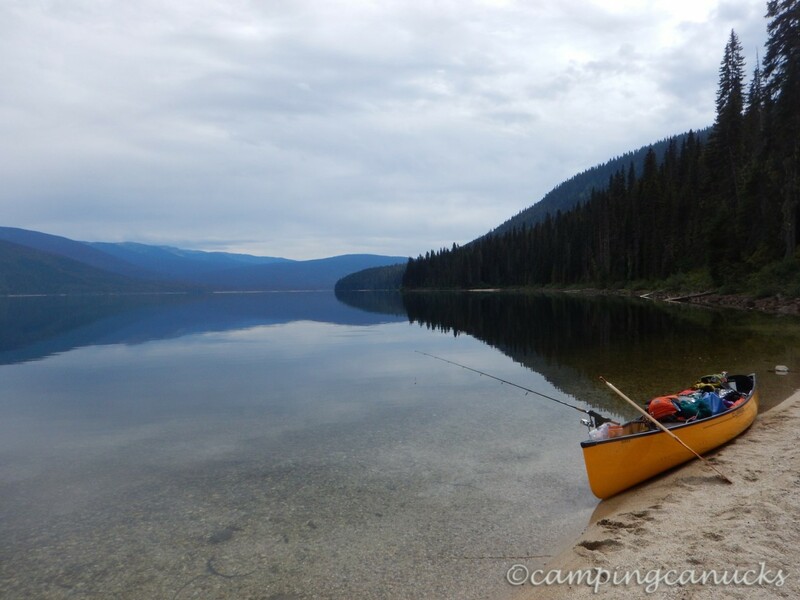 But since it was only noon, we got ourselves back in the canoe and carried on, fully expecting to find many more amazing views and campsites along the way. We traded places so that I was in the front and I leisurely threw my fishing rod into the water to see if anything took the bait. Being that we saw plenty of fish hitting the surface, we were hoping for something a little fresh for dinner. Alas, it was not to be. Four days of trolling didn’t work out for us. 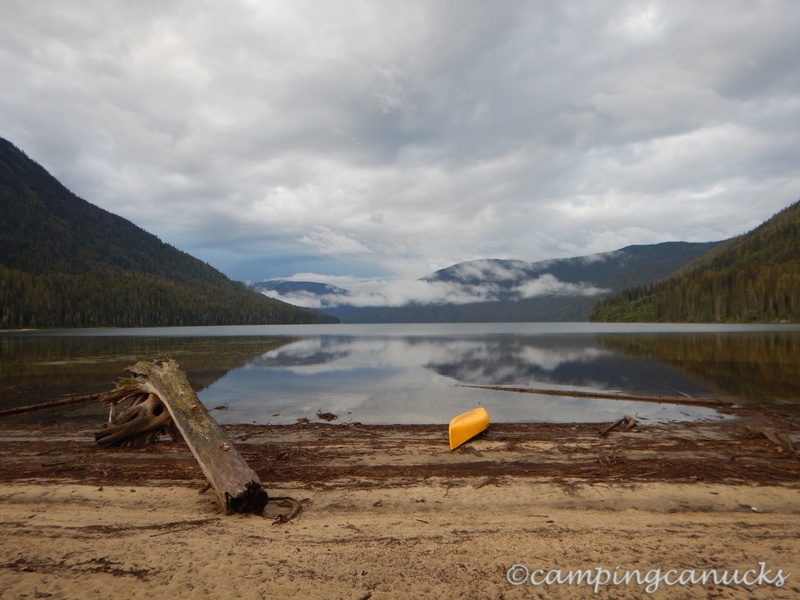 We paddled for the rest of the day, stopping at every campsite to check them out. Some were occupied and some were empty. Generally the nicer the site, the more likely there were paddlers already camping there. In the end, we settled at the Cottonwood camp as there was an excellent spot available. We later learned that a woman died at this site last year when one of the cottonwood trees fell on her tent in the middle of the night. 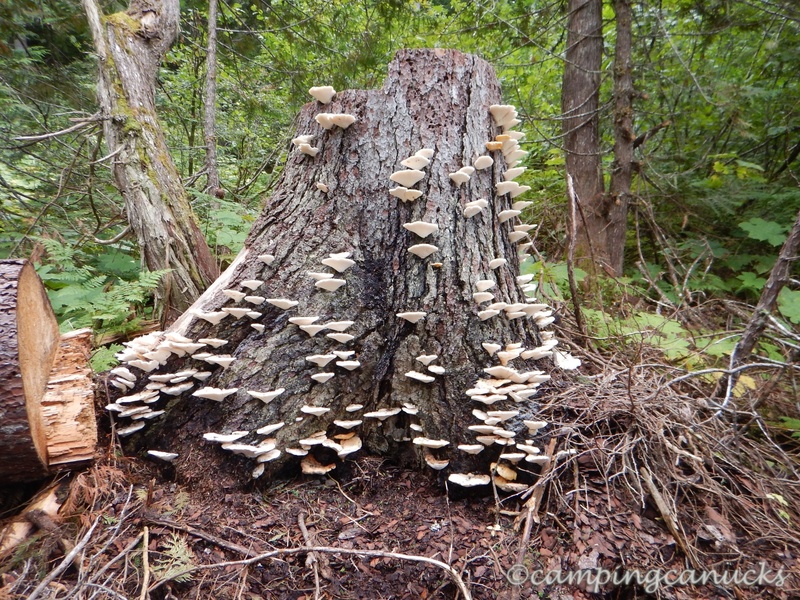 We were glad we didn’t know that when we camped at the site. Being that we had brought along a cooler, we had a great dinner of grilled chicken and vegetables, all cooked up on an open fire. It’s nice later in the season when there is no fire ban and plenty of wood to be found. There’s nothing like sitting by a beautiful lake on a warm, late summer evening enjoying a fire. It wasn’t quite as clear the next day with most of the sky overcast, but the lake was amazingly calm. There was barely a wave to be seen. 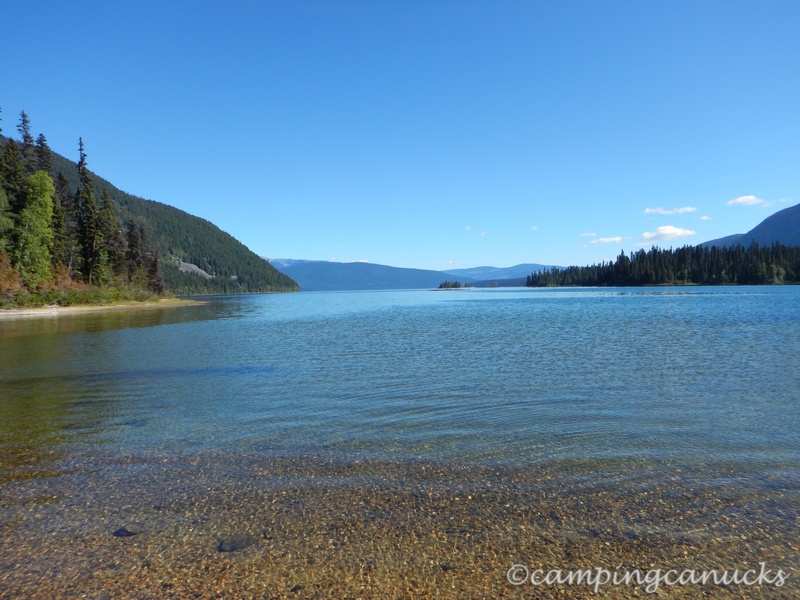 We debated whether to head on to the west side of the lake or go north. In the end, we decided to head towards the northern end of the lake, stopping at every site we passed, and grabbing any geocaches that were to be found. 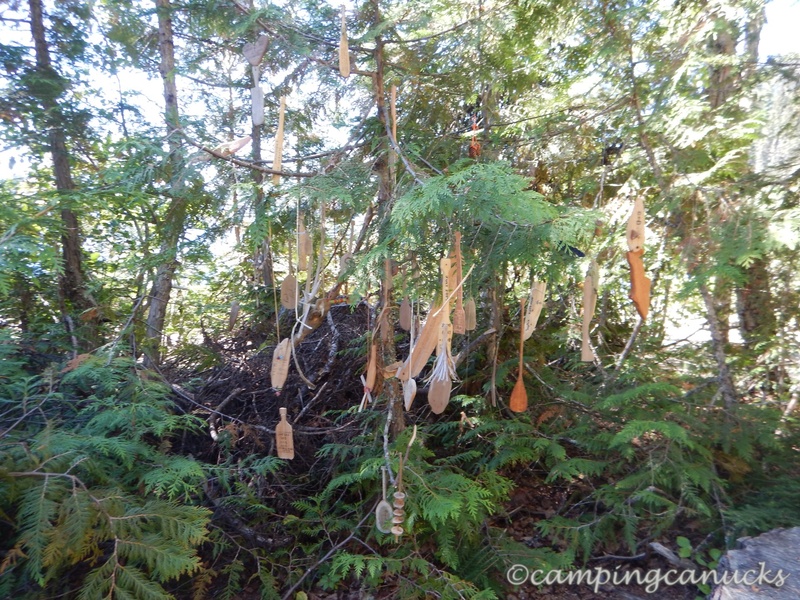 There were a lot of neat things to see along the way and some interesting points to note about the campsites we passed. For example, the outhouse at the Sunshine Cove site had no door and the outhouse at Wavy View required switchbacks to reach. At the Little Anderson site, someone had built an elaborate table out of stone that would have made a great cooking surface. 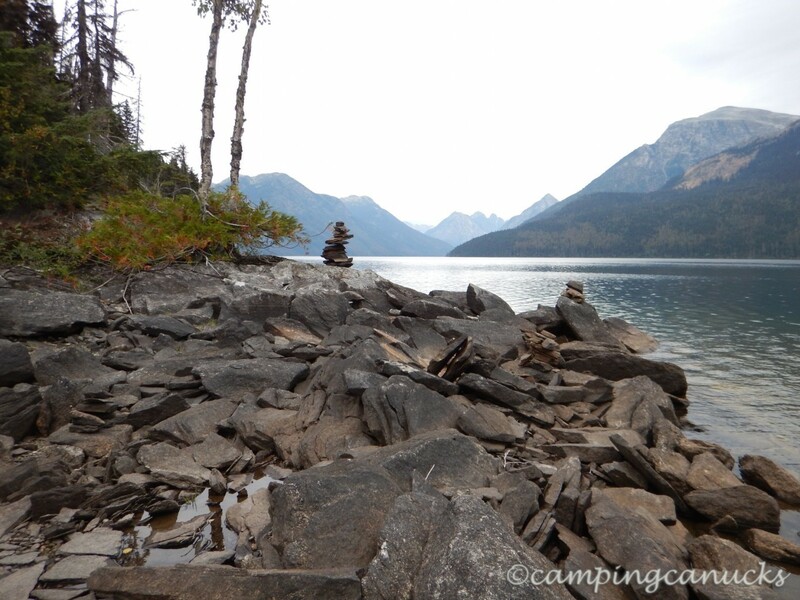 This was a leisurely day and each time we came to a site, we just decided to keep on going and exploring the lake. Eventually we were able to see the far end of the lake. By this time, the wind had started to come up so it was getting pretty rough on the water. With the Eagle Point site coming up, we were thinking that we would possibly stop there for the night. However, as we made our way to the site, we passed another couple who were camping there already. Judging by their response when we greeted them, it was obvious they did not welcome company. With that in mind, we took a quick look around the site and then made our way to the Murtle Beach site at the northern end of the lake. It was very windy from here but luckily for us, it was a tail wind and helped push us along, although it made steering fun at times. Murtle Beach feels remote. 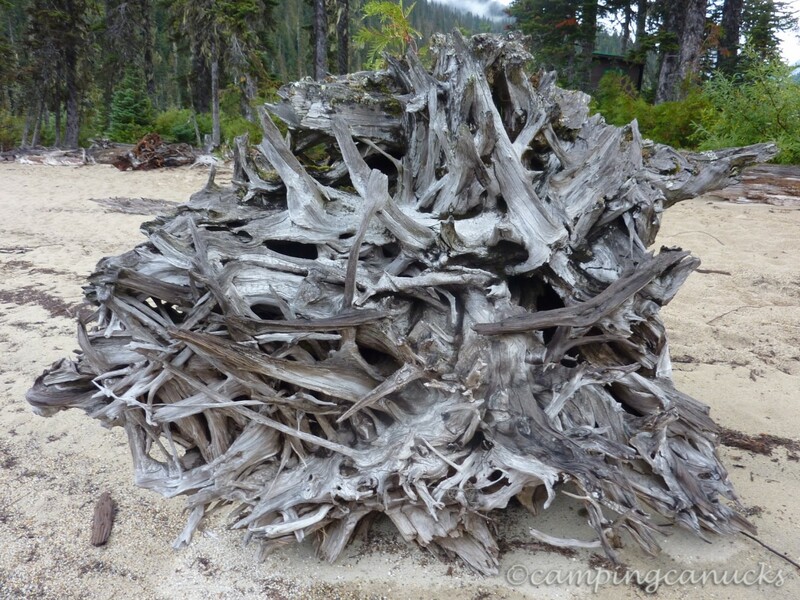 With a long stretch of beach, surrounded by steep peaks, and littered with driftwood and debris, it has a real west coast feel. We almost felt as if we were on some remote fjord, far away from anyone. There is really only one good camp site at Murtle Beach so we set ourselves up and settled in for the night. It was windy at first but eventually the wind settled down with dinner being steak and potatoes, and beer. Backcountry luxury! This was also the night when the weather began to turn and we wouldn’t see much of the sun for the next couple of days. It didn’t rain all the time but when it did, it rained pretty damned hard. We awoke on our third day to a rather dreary and blustery day. It had rained on and off during the night but fortunately we were able to make breakfast and pack without getting rained on. Packing wet gear is never fun but it’s certainly easier when it’s being loaded into a canoe versus into a backpack you have to carry. Our plan for this day was to get to the Strait Creek camp as we were intending to hike our way up to Wavy Crest Peak the following day. We had a tough start as we left Murtle Beach due to a mean head wind we had to paddle into but we were able to hug the eastern bank and avoid the worst of it. Eventually the weather became increasingly bad and we had to stop to put all of our rain gear on. The only good thing about the rain was that the waves would calm down a bit. For the most of the day, we rode over swells that made it a tough trip to the Strait Creek camp. After hours of hard paddling, we eventually reached the beach near the camp for a bit of a break. We checked out the site and decided this was where we would be spending the night. It was looking less and less likely that a hike up Wavy Crest was going to happen as it was very socked it. You couldn’t even tell there were mountains nearby due to the thick clouds capping their peaks. With that in mind, we checked out each tent pad and fire ring until we found the most sheltered one and unloaded the canoe. However, the weather just wouldn’t let up and we spent hours huddled under our tarp with our gear waiting for a break in the rain and wind so that we could pitch the tent and setup camp. The rain finally stopped but the wind did not. This made it hard as we needed the fire to cook dinner but the fire ring was downwind of us. In the end, we were able to get the fire going, cook dinner, and call it a day. Wave after wave of heavy rain just came rolling on through all night long. Day four began with rain and wind. Lots of wind. So much in fact that when we finished breakfast, there were two foot swells rolling onto the beach. And hiking to the top of Wavy Crest Peak was out of the question. After a bit of discussion, being that we were only about twelve kilometers from the lagoon, we decided that we would brave the storm and leave a day earlier than planned. The weather outlook was not looking good. Loaded up and ready to go, we headed out onto a nasty lake being whipped up by wind. We were rocked and bounced around as we made our way south the Murtle Lagoon. 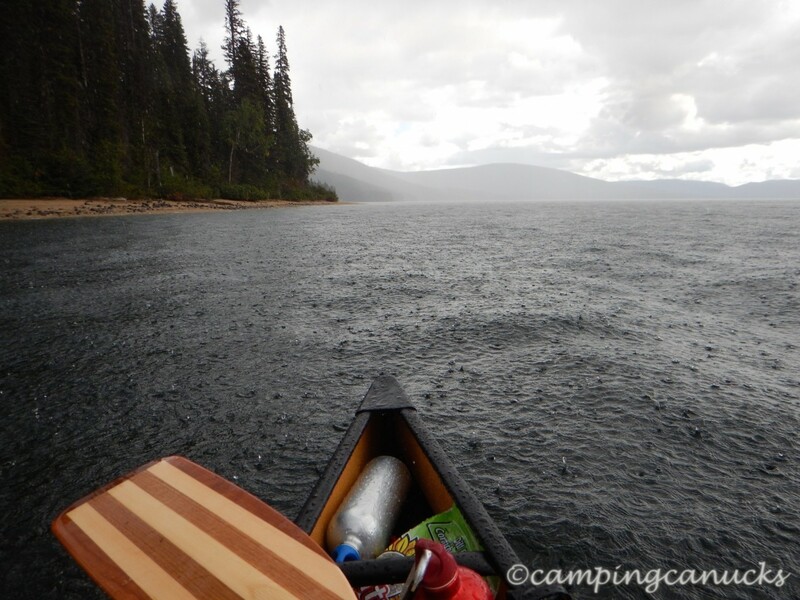 The rain had mostly stopped but the wind just wasn’t going to let up as we fought our way along and we were glad that we had a lot of weight in the canoe. It certainly helped with the balance and stability. We have to hand it to Clipper; the Tripper is a rock solid canoe in rough waters. But we didn’t make it to the Lagoon. As we rounded one of the rocky points along the way, we realized more and more that it was just not safe to be on the water. It was a nerve wracking experience fighting with all of our strength and skill to avoid getting pushed into the rocks, which would have been disastrous. We decided at that point that we were going to stop at the next safe landing point and wait out the storm. Whitecaps over three feet high were now hammering at us and it was rapidly becoming a rather scary experience. Shortly afterwards, we spotted a nice beach and headed on in. It was a little easier at this point as the wind was behind us but it still made for some tricky paddling. And as we got closer, we spotted another canoe on the beach with a tent setup nearby. After pulling in, we found another couple had also stopped here to get off of the lake due to the storm the previous day. It made us feel kind of foolish (and somewhat proud) that we had paddled as far as we did this day. As they had already been there for a night, they had their tent and a nice little shelter already set up. We figured we would hang out and see if the storm would clear but it became quite obvious as the day progressed that the storm was not going to let up and it would just not be safe to proceed. In fact, at one point, we watched through binoculars as two kayakers tried to battle their way across the lake. We were too far to make out details but one of them looked to be in serious trouble and was floundering around as the other tried to help. The ranger came by around this time as he had been alerted by friends of our beach mates that they were somewhere on the lake. He made sure that we were all OK and settled, and understood that we were all camping at an unmarked site due to the weather. We told him about the kayakers and he went off to check on them. Late in the day, we finally unloaded the gear and setup for the night. We still had plenty of food available, including banana bread and Jiffy Pop popcorn, so we all enjoyed an extravagant dinner with wine and beer. We all elected to name this site “Decadence Bay” in memory of our great night stranded together on this wonderful lake. The next morning came about with greatly reduced winds and we packed, loaded, and made our way over to Murtle Lagoon. Our beach mates joined their friends there and we proceeded to the lagoon and the portage back to the car. It was an easier trip out with a bit less weight and a better means of pulling the canoe along the trail. Murtle Lake is a fantastic place and we look eagerly forward to another trip to this wonderful location. The lack of motorized boats makes this a very special experience with nothing but the stroke of the paddle to break the peace. There is a lot of lake to see and we have yet to explore its western regions and its many hidden gems. We also very much want to hike and possibly spend a night on the Wavy Crest Peaks. 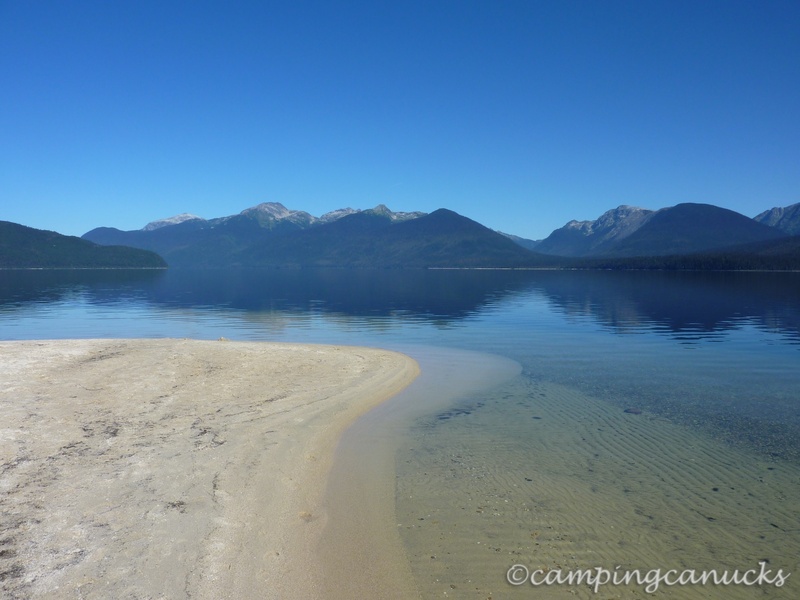 For anyone looking for one of the best paddling experiences in the world, this is definitely a lake to check out.